Here is a rambling example of how I go about computing an atomic rocket. Beware that I am prone to amateurish mistakes in arithmetic so double check the math before you use the figures. 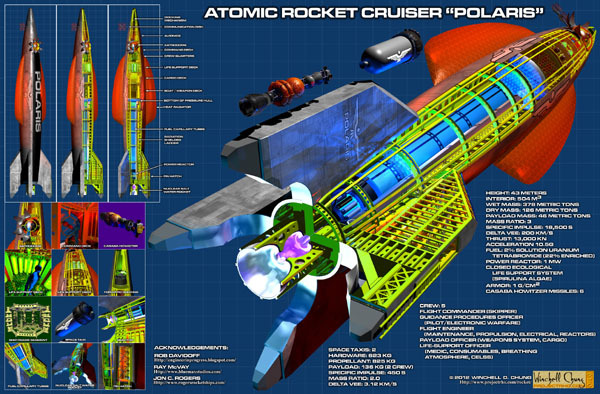 As a model we will use the classic atomic rocketship the Polaris from the Tom Corbett Space Cadet books. 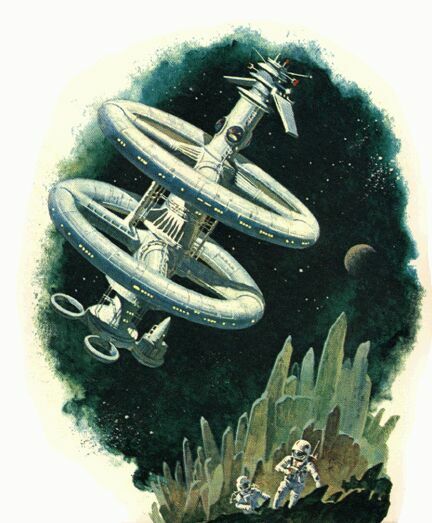 Actually, the Polaris is so classic (i.e., 1952) that I fear most younger readers have never heard of it. 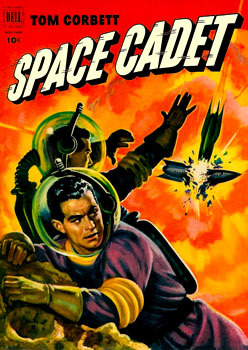 Tom Corbett Space Cadet was an action packed science fiction series aimed at the juvenile demographic, appearing in hardback novels, comic books, Sunday newspaper comic strips, radio serials, and a TV series. Not to mention coloring books, punch-out books and View-Master reels. What is really sad is that the youngest of the younger readers have never heard of radio serials, View-Master reels, and punch-out books either. Sunday newspapers and hardback novels are on the way out, and I'm sure it is just a matter of time before comic books, coloring books and TV series follow them. But I digress. 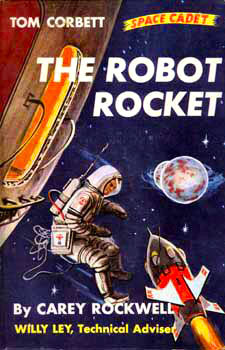 Anyway, the Tom Corbett books were "inspired" by Robert Heinlein's classic novel Space Cadet (if you like this website you'll probably like this novel). If you are vaguely interested in the the Tom Corbett novels they are out of copyright and are available as free ebooks (but if you are expecting deathless prose you will be sadly disappointed.). The technical adviser was the legendary Willy Ley who did his best to keep things scientifically accurate but was often over-ruled. 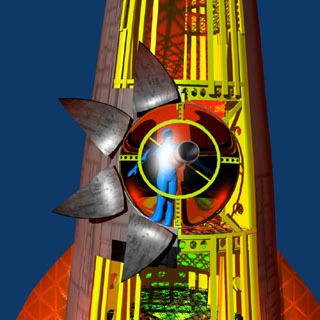 As near as I can figure the Polaris in the novels had some sort of closed-cycle gas core nuclear thermal rocket engine. 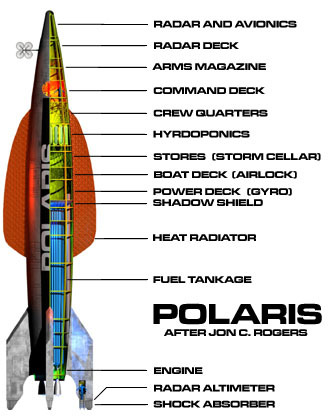 According to the novels the Polaris is 61 meters tall (200 feet) and 181 metric tons of mass (200 US tons). However, the indispensable Spaceship Handbook, scaling from images from the TV show, say it is closer to 43 meters (140 feet). That seems more reasonable to me. I'll keep the ship's dimension, but I'm not going to try and keep the Polaris at 181 metric tons. Instead I'll see what mass is implied by the calculations. Examining the blueprints in the Handbook, the ship has enough of a torpedo shape that trying to figure the volume using the formula for a cylinder probably won't work. The lower part, maybe, but not the top. Using the information from the blueprint about the ogive curves, I'll model the upper part as a cone 5 meters diameter at the base and 23 meters high. 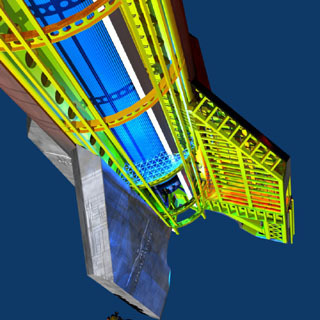 The lower part (i.e., to the base of the engine, not to the base of the fins) is approximated as a cylinder 5 meters in diameter and 16 meters wide. Volume of a cone = 1/3πr2h = 1/3π2.5223 = 164 m3. Volume of a cylinder = πr2h = π2.5216 = 340 m3. So the total interior volume of the Polaris is 164 + 340 = 504 m3. Now for the Mission. I'll cheat and examine the Mission Chart. The line for the year 2090 is attractive. The next year entry is the start of those huge deltaV Brachistochrone capable engines. Just to keep the Polaris closer to current capabilities, I'll opt for the 2090 engine performance. This means a month and a half transit time to travel to Mars, and seven and a half months to the Asteroid Belt, but that's not too unreasonable. The 2090 specifies a NSWR using a 22% uranium tetrabromide solution (i.e., mostly water). Exhaust velocity of 182,000 m/s, thrust of 13,000,000 N, and 10 metric tons per engine. I will mandate that the Polaris will have to be capable of acceleration up to 10 g (98 m/s) (so as to reduce gravity drag), and have a mass ratio of 3 (because that is what the Mission Chart assumes.). 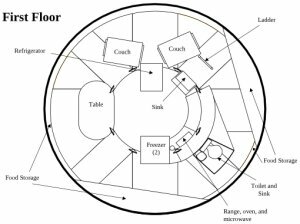 How to decide on the interior tankage? Well, I decided to try and sneak up on the problem. I'll do the calculations for a Polaris that is 30%, 50% and 60% propellant, by volume. Then the most attractive results will be chosen. First the 50% option. 504 * 0.5 = 252 m3 propellant tankage. 252 * 1000 = 252,000 kg or 252 metric tons. Since the mass ratio is 3, the dry mass is 126 metric tons, for a total mass of 252 + 126 = 378 metric tons. The Polaris is mandated to have an acceleration of 10 g (98.1 m/s). One NSWR has a thrust of 13,000,000 N. This would result in an acceleration of 13,000,000 / 378,000 = 34.4 m/s. Convert to gs: 34.4 / 9.81 = 3.5 g. Not good enough. Three NSWR have a thrust of 3 * 13,000,000 N = 39,000,000 N. 39,000,000 / 378,000 = 103 m/s. 103 / 9.81 = 10.5 g. That will do. 3 * 10 metric tons per engine = 30 metric tons total engine mass. This will come out of the dry mass capacity. Now to figure the structural mass. The Polaris has a density of (M/1000) / V = (378,000 /1000) / 504 = 0.75 tons/m3. The structural volume required to support the spacecraft is = (V4/3 * Apg0 * D) / (1000 * Thm) = (504 1.333 * 10.5 * 0.75 ) / (1000 * 2.86) = 11 m3. 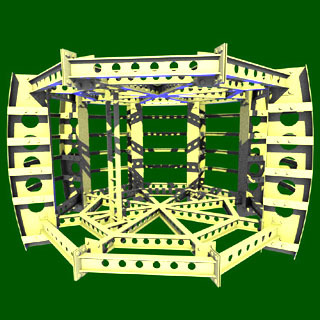 The structural volume needed avoid buckling is = (V1.15 * (Apg0 * D)0.453) / 300 = (504 1.15 * (10.5 * 0.75 )0.453) / 300 = 11 m3. Since both are the same, the actual structural volume is 11 m3. We'll make the hull out of titanium. The density of titanium is 4,507 kg/m3 (compared to 7,850 kg/m3 for steel and 1,738 kg/m3 for magnesium) so the structural mass is 11 * 4,507 = 49,580 kg = 50 metric tons. 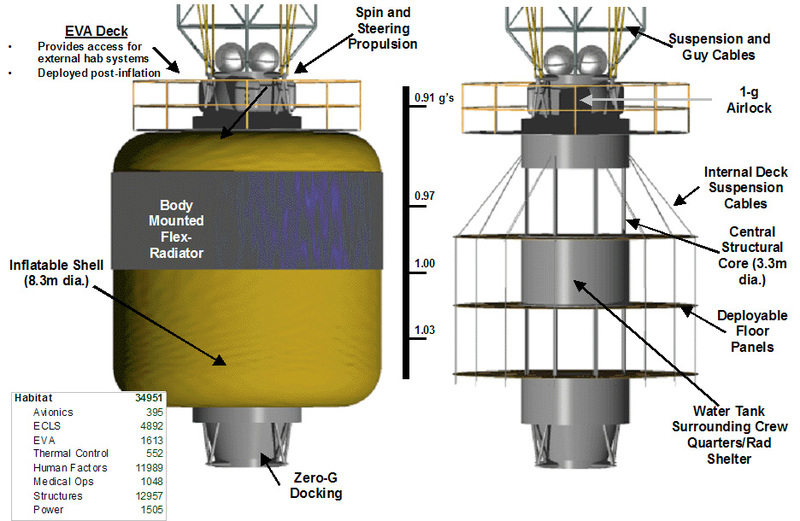 The available payload (i.e., mass and space for everything that isn't propellant or structure) is 126 mton dry mass - 30 mton engine mass - 50 mton structural mass = 46 metric tons available payload mass. 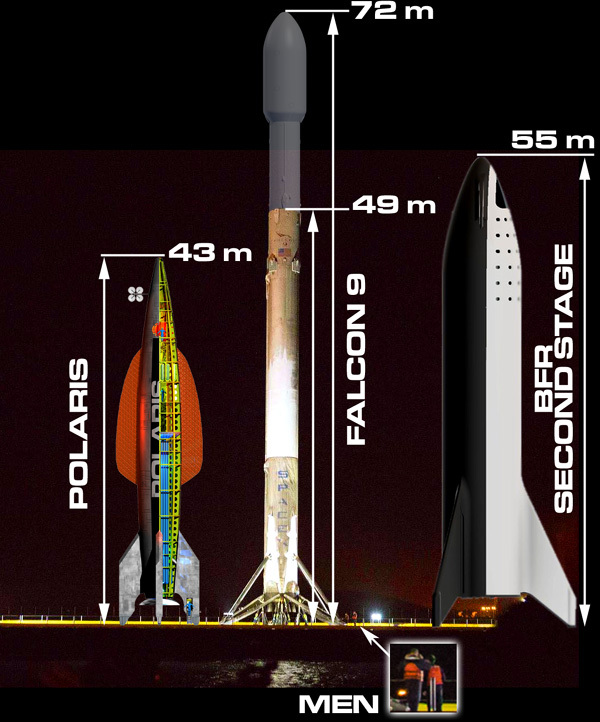 504 m3 total volume - 254 m3 propellant volume - 11 m3 structural volume = 241 m3 available payload volume. The table makes it clear that there is a trade-off between volume and mass. If you only look at the available volume and mass, I suppose one could use calculus to make a min-max function and find the perfect balance (my knowledge of calculus is not equal to the task, alas). Of course, the other factors are important as well, the accountants will be interested in how much it costs to fill the propellant tanks with uranium tetrabromide. For no particular reason, I'm going to go with the 50% option. This gives me 46,143 kilograms and 252 m3 of payload to play with. The available payload volume and mass has to hold everything else. Heat radiators, air, food, water, radar gear, lifeboats, air ducting, sewage treatment, damage control replacement parts, ship's surgery, space suits, crew members, atomic torpedoes, laser cannon turrets, hammocks, periscopic sextant, toothbrushes, toilet paper, everything!. And don't forget the tail-fins. The air won't mass too much. 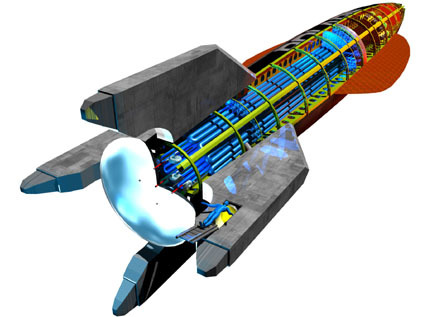 The 50% propellant option has a payload volume of 241 m3. Air at one atmosphere of pressure has a density of 1.2 kg/m3, so the mass of air required to pressurize the entire payload section is 241 * 1.2 = 289 kg or 0.3 metric tons. That is just to pressurize the section, more will be required as the crew consumes oxygen. Each crew member requires 10 litres of water, which is recycled. 0.25 litres will be lost each day due to inefficiencies in recycling, so each crew member will require 10 litres + (0.25 litres * 480 days) = 130 litres = 0.13 m3 of water, which will mass 0.13 metric tons. Multiply by 5 crew members and the grand total is 0.65 m3 and 0.65 metric tons. Each crew member requires 48 litres of air per day. 48 litres * 480 days = 23,040 litres. 23,040 litres * 5 crew = 115,200 litres or 115 m3. Air is stored at 250 bar, so the actual volume is 115 / 250 = 0.46 m3. Air has a density of 1.2 kg/m3 so the mass is 115 * 1.2 = 138 kg or 0.1 metric tons. Each crew member requires 2.3 kg of food per day (except for Astro, who can eat enough for three people). 2.3 kg * 480 days = 1,104 kg. 1,104 kg * 5 crew = 5,520 kg or 5.5 metric tons. Food has a density of roughly 0.375 kg per litre, so 5,520 / 0.375 = 14,720 litres or 15 m3. This is the bare minimum, increase to raise the crew's morale. The grand total for consumables is 0.65 metric tons water + 0.1 metric tons air + 5.5 metric tons food = 6.25 metric tons total. 0.65 m3 water + 0.46 m3 air + 15 m3 food = 16.11 m3 total. From Outrim by J. Mauloni. 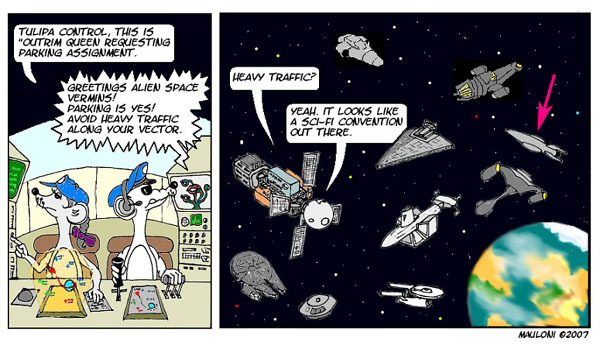 Another scientifically accurate webcomic. Note the Polaris at the red arrow. and in the center an Imperial Star Destroyer from Star Wars. I belatedly realized that I am an idiot, overlooking a resource that I can plagiarize ... er, ah ... research. 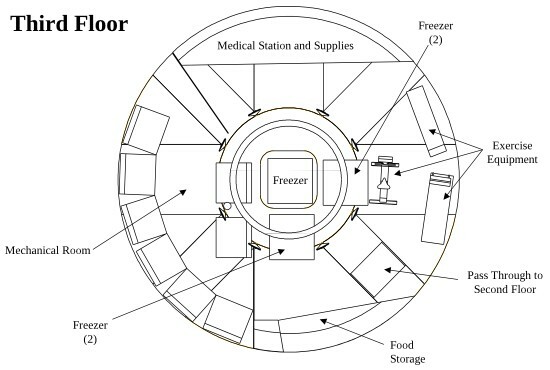 Back on the Advanced Design page was a section talking about a NASA report on TransHab which included a detailed break-down of the mass budget for a habitat module. It was for a six crew member mission with a duration of 18 months, which is close enough for government work to the Polaris' five crew member 16 month mission. I can cut and paste it into this example and see where it gets me. So ignore all the calculation in the "Life Support" section above. Refer to the original report for more details on each habitat module item. 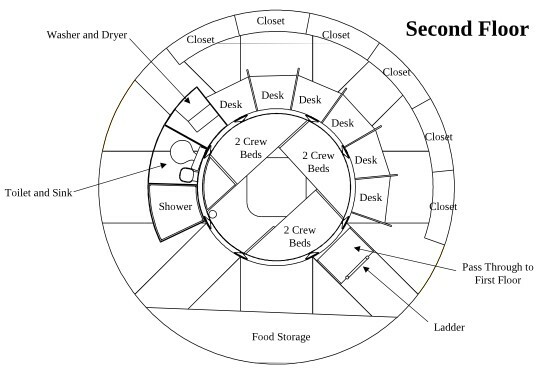 The paper totals up all the cubic meters under "Crew Accomodations" and uses that as a first approximation for available living space. It comes to about 168 m3. Divide by 5 crew members and you get 33.7 m3, which is about twice the spartan bare minimum of 17 m3. You will also note that each crew member has been alloted 30 kg/0.6 m3 for personal and recreational items. I'm not sure what the power budget for the Polaris will be. With the severely limited payload allowance, I'm sure it will be impossible to fit in a massive power hog system like a Free-electron laser. Until I can figure out something better, I'll just assume it needs one megawatt. Later I might try to figure out the surface area of the Polaris' heat radiators and do some pointless calculations on the maximum power size. 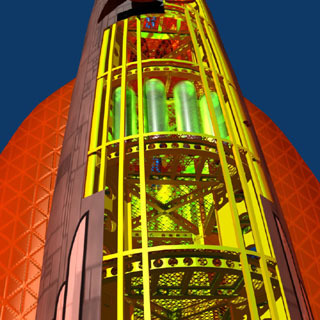 On the Basic Design page, it describes a 1 megawatt reactor that has a mass of 493 kg. I have no idea what its volume is, though. We need a shadow shield to protect the crew from the deadly radiation from the reactor. The SPAD has a typical shadow shield as about 3,500 kilograms per square meter of shield. Yikes! 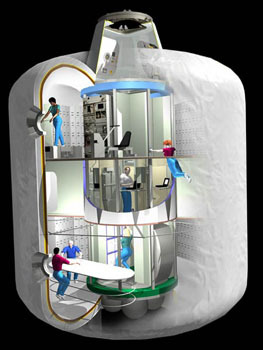 For first approximation the shield is a disc with a radius equal to the reactor core. Somewhere (I'll look it up, I promise!) 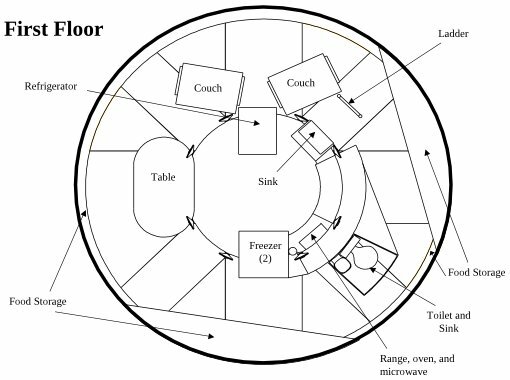 I saw a NASA paper on an ion-drive spacecraft with a 1 MW reactor with a radius of 18 centimeters (0.18 meters). This would make the shield 356 kg. Not sure about the volume, but at those densities it cannot be much. The heat radiators are external, so their volume does not have to be subtracted from the payload volume. At the link, the quote from Tremolo says "Our current light water reactors have about a 35% efficiency for conversion to electric power." So if the reactor is putting out 1 MW of usable power, it is putting out 1.9 MW of waste heat. Optimistically a radiator is about 0.01 kilograms per waste kilowatt dissipated. So the radiator will be about 83 kilograms. 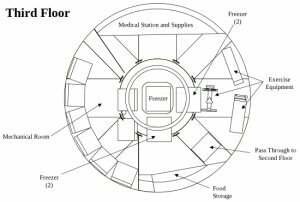 After deducting the crew, habitat module, and reactor from the available payload we find that there is 22,715 kg and 24.3 m3 with which to customize the Polaris. 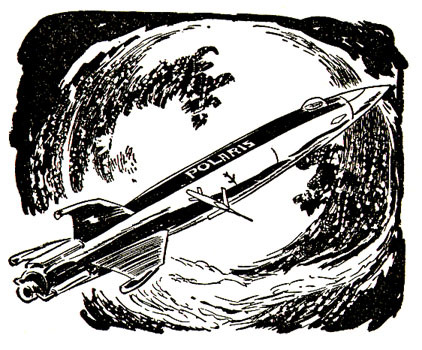 The Tom Corbett Space Cadet novels mention that the Polaris has a couple of "space boats." 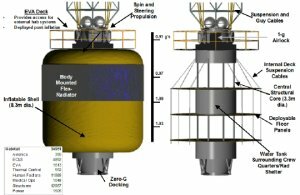 A couple of fully fueled Project Orion 2-person space taxis will cost 2896 kg and 4 m3. Throw in one refuel for each for an additional 1650 kg and 1.65 m3. Armor is a problem, it really eats into your payload mass allotment. One 5 g/cm2 (50 kg/m2) over a ship with a surface area of 433 m2 is 21,650 kg. This would eat up almost all of our remaining payload. I'll scrimp and only use 1 g/cm2. That is only 4,330 kg, but the question arises is such a tin-foil like layer of armor even worth it? And just for the heck of it, issue each of the crew members a Gyrojet rocket pistol with 18 rounds (3 magazines). Hey, if a rocket gun is good enough for Buck Rogers, it is good enough for the Polaris crew. Each pistol is 0.4 kg, and each round is 0.009 kg. This will leave a paltry 6,939 kg 11,884 kg and 16.25 m3 for random cargo. With such a limited payload, what is the Polaris useful for besides transporting five people? This probably means that the Polaris design should be scaled up a bit. The habitat and reactor mass is fixed, scaling up the ship will give more remainder payload to add goodies. Byron Coffey did an analysis of the Polaris performing a lift-off from Terra. However, this is grossly overpowered. To avoid going into a ludicrously high orbit, I had to dial the initial angle way down, which is undesirable because of what it does to the drag number, and the fact that you're flying low to the ground with a NSWR. Also, there's going to be more drag after burnout, so the delta-V here is quite low. It turns out that flying a lower T/W gives better overall performance. It looks like T/W 3-4 on launch is about perfect. I suspect there's still going to be a reasonable amount of drag, but it's not totally outrageous. Also, lower T/W would mean you need less engine, and can have more other stuff onboard. I'm still trying to work out a way to get the code I have into a form people who don't have MATLAB can use. I can do better than that. I played with the numbers a bit more, looking at a ~200 km orbit, and I've included all three outputs. The code also outputs a couple of plots, but it's going to take a little while to get all three sets of data on the same axes and in a form that might be postable. I did a bit more tinkering, and managed to get the code to run each version out to 8 minutes, which meant it was able to account for all of the drag. I've attached the revised plots, and the results. I compensated the gravity drag values for this, so they're only the drag values during the burn, and the factor is only relative to the burn. Note that these are not necessarily the most efficient trajectories to fly. All involved using 8600 m/s for the initial boost, and then aiming for a ~200 km orbit, with circularization delta-V being the only variable. I'm going to play with lowering the initial delta-V (which was originally a rectal extraction anyway) and seeing if I can find more efficient flight paths with more of the burn made outside the atmosphere. This should improve things some, although I expect that the T/W = 10 will still do poorly. I did some tests at reduced initial delta-V. I didn't plot any of them yet, but they should provide some idea of what sort of trajectories are possible. I should add that I was playing with the total time to get the final altitude in the ballpark I wanted it (~150 km). Also, it should be noted that the gravity drag figures are not reliable, as I did not compensate them like I did those above. The drag magnitude is for the entire period of integration, which varied depending on the initial delta-V.
At this point, delta-V for the T/W = 3 case is going up, so I dropped it from further tests. T/W = 4 has started to go up, so it has also been dropped. At this point, the model is starting to break down slightly. I'm not certain that burns as big as this one can be assumed to be instant, which is the basis for the calculations. However, I will ignore this, as the approximation should still be pretty good. So it turns out that the absurdly high acceleration didn't cost as much as you might think, and is in fact very close to the other T/Ws, although the circularization burn is larger than the initial burn. Overall, though, you're better off with the smaller engine. Shameless plug, I made a poster of the Polaris, you can purchase it here. The details are more or less the ones calculated for the 43 meters tall Polaris. This is the shorter of the two Polaris versions, but as you can see it is still freaking tall. The door on the tail fin at the top of the ladder is 2 meters tall, just to give you some idea of scale. 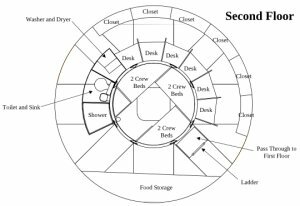 The basic outline is as drawn by master researcher and blueprint draftsman Jon Rogers. The ship's skeleton was designed by an engineer who goes by the handle JanJaap. Additional engineering expertise was supplied by Rob Davidoff. 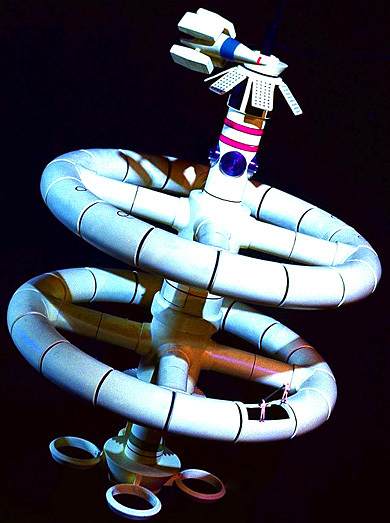 The crew is based on the budget version of the Mission Control Model proposed by Rick Robinson and developed by Ray McVay. The structural girders are painted a splendid bilious zinc chromate yellow-green. They are also full of circular lightening holes. There is an over-sized astrodome for navigation purposes. The life support deck has huge glowing green tanks filled with spirulina algae. The magazine contains six deadly missiles with Casaba howitzer warheads, ready to skewer hostile warships with swords of pure nuclear flame. The hangar bay carries two space taxis. And the propulsion system is Zubrin's outrageous continuously-detonating Nuclear Salt-Water Rocket. It is amazing what one can create with an open-source CGI editor application like Blender, and a lot of work. Plus a little help from your friends, and from the website you wrote. This gives you an idea of the detail. 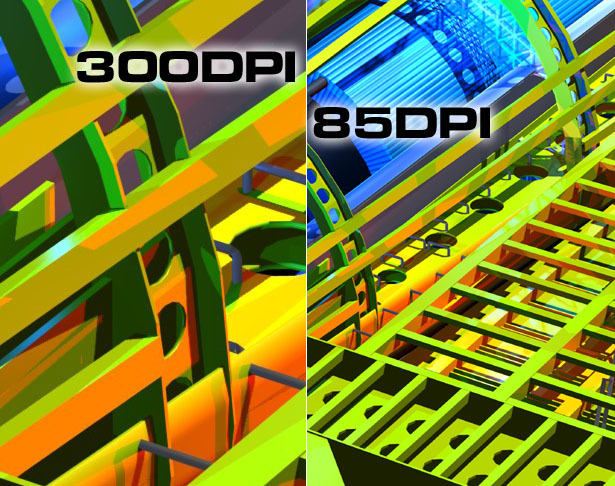 The 300DPI shows how fine the detail is, the 85DPI is about the actual size it will appear on the printed poster. This is a selection of the ship scenes in the lower left.